If you’re like many people, two little words may strike fear in your heart. Those words? Root canal. Some people are even more nervous about having a root canal than having a tooth pulled. But your Macon dentists Clinton M. Watson, DDS, MBA and Nicole L. Jackson, DDS, at Northside Family Dentistry want you to know that there are many myths about root canals that are simply unfounded. Dispelling those myths may help calm your fears about having the procedure. Truth: Contrary to popular belief, root canals should not be any more painful than any other dental procedure. Your dentist will numb your teeth and gums for the root canal and you should not experience any discomfort. If you experienced a toothache prior to the procedure, that pain should be relieved after the root canal is performed because it removes the infected tissue. If you are especially nervous, Macon patients have the option of choosing sedation dentistry which can calm your fears or even let you sleep during the procedure. Truth: Most root canal procedures can be completed by your dentist in one or two dental appointments. After the root canal is performed, your dentist will then assess the type of tooth restoration that is necessary which may take additional dental visits. Truth: Once upon a time, some dentists believed that releasing the trapped bacteria in the tooth’s pulp could cause illness. But no current research supports this theory. 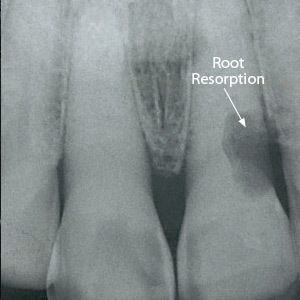 Root canals do not appear to cause any illness. Truth: Even if a tooth is not infected or hurting, it still may need a root canal. In some cases, a tooth is dead or dying and a root canal is necessary to prevent it from becoming infected. Your dentist will monitor your oral health at each visit and let you know if any of your teeth show signs of decay that may warrant a root canal. If you’ve been nervous to make that dental appointment because you fear those two little words, fear no more. A root canal can be just what your teeth need in order to be saved and to stay intact. If you’re still nervous, Northside Family Dentistry in Macon, GA offers sedation dentistry that can help you through the procedure. Schedule an appointment today to talk to your dentist about the benefits of a root canal to save a tooth at (478) 475-1976.